Everyone knows that bees love to visit flowers, but not everything you see visiting flowers or buzzing around the garden is a bee. In fact, many insects imitate bees to avoid unwanted attention from predators such as birds. Whether you call them “bee mimics,” “wanna-bees” or “yellow stripey things,” most of them are beneficial helpers in our yards and gardens. Learning how to identify the insects that look like bees will help smart gardeners know and protect these vital pollinators. Some flies, especially hover flies and bee flies, can be mistaken for bees because their body form, yellow and black color, fuzzy hairs, buzzing sounds and behaviors mimic bees. Flies have only two wings (forewings) because their hind wings are reduced to knoblike balancing organs called halteres (Figure 1, red circles). In contrast, bees have four wings (two forewings and two hind wings). Flies have large compound eyes that occupy most of the head, while bees have narrow compound eyes on the sides of the head. Most bee-like flies have short antennae, while bees have longer, cylindrical antennae. Some flies, especially bee flies, are quite hairy and similar to honey bees (Figure 2), bumble bees and other native bees. Flies also hover and move quickly from flower to flower while foraging. Unlike bees, flies do not have a stinger and are not a threat to gardeners. Hover flies (Family: Syrphidae) (Figures 1 and 3) resemble bees in coloration, behavior and size. 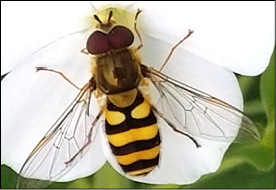 Many hover flies are ¼ to ½ inch long and have large heads with reddish or marbled black eyes, two clear wings and yellow-black patterns on the abdomen. Some hover flies are quite hairy, while others are not. Hover flies buzz like bees and are important pollinators. They use sponging mouthparts when feeding on pollen and nectar. Some hover fly larvae are key predators of soft-bodied insect pests, such as aphids, and provide free biological control of garden pests. Bee flies (Family: Bombyliidae) (Figure 4) are about ¼ to ½ inch long and have stout bodies covered with yellow, black and/or brown hairs. Some species have transparent wings, while others have wings with dark patterns. 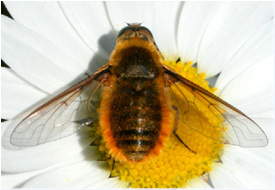 The bee fly uses a long proboscis (tongue) for feeding on pollen and nectar in flowers. Because their bodies are hairy, they can carry and transfer a large amount of pollen to flowers. 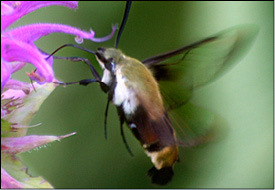 Hummingbird clearwing moths or hawk moths (Family: Sphingidae) (Figure 5) are approximately 1 to 1½ inches long, with a robust body. Front wings are narrow, elongated and clear, with a black or brown borders and a wingspan of 1½ to 2 inches. These moths look more like hummingbirds than bees. These moths feed using a long proboscis (tongue) to siphon the nectar. At twilight, hummingbird moths often flit from one flower to the next. Flowers that are most attractive to hummingbird moths are light-colored (white), with a strong scent, such as garden phlox. Wasps appear less hairy than most bees (Figures 2 and 6). Using a microscope, you can see the hairs of wasps are simple (not branched), while hairs of bees are branched. 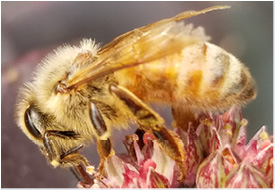 Most bees have special pollen-collecting hairs or baskets on their hind legs (Figure 6). Leafcutter bees collect and carry pollen on hairs underneath their abdomens. Both wasps and bees have four developed wings and two long segmented antennae. Wasps also have an elongated body with a distinctly visible narrow “waist” (Figure 7), a constriction between the thorax and abdomen. 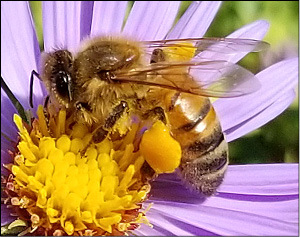 In contrast, bees have a more robust body and the waist is not readily visible. The colors and patterns of wasps are typically brighter and more diverse than bees. Paper wasps, yellowjackets and bald-faced hornets are social wasps that nest in colonies, and frequently visit and pollinate flowers. Another benefit of these wasps is that they are important predators of caterpillars (or insect pests) in gardens. Paper wasps (Family: Vespidae) (Figure 7) are approximately 1 inch long, with black, yellow, brown or sometimes orange markings. Their paper nests occur in sheltered areas, such as under house eaves, inside open pipes or tree branches. Paper wasps are not as aggressive as yellowjackets and bald-faced hornets, and only attack if they or their nest is threatened. 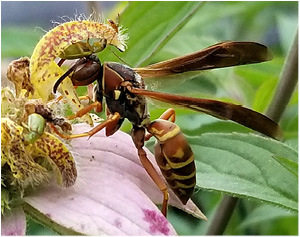 Yellowjackets or hornets (Family: Vespidae) (Figure 8) are approximately ½ to 1 inch long, with a yellow face except for the black eyes, black antennae, and yellow and black bands on the abdomen. Yellowjackets usually nest in the ground and will defend their nest aggressively. 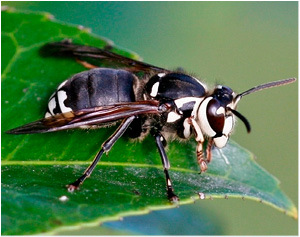 Bald-faced hornets (Family: Vespidae) (Figure 9) are about ¾ to 1 inch long, and have black with light yellow to white markings and a white tip at the end of abdomen. Their large paper nests are easy to see in tree limbs and sometimes in roof peaks. Bald-faced hornets are very aggressive and sting repeatedly if you get too close to their nest. 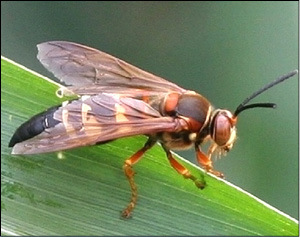 Cicada killers (Family: Crabronidae) (Figure 10) are solitary wasps and large (¾ to 2 inches long) with a yellow face, red eyes and a black abdomen with yellow bands. Wings are brown and legs are red. Most solitary wasps have a short tongue, so they prefer flowers with shallow nectar reserves. As its name implies, the Cicada killer preys on cicadas, and then provisions its nests with the prey as a food source for developing larvae. 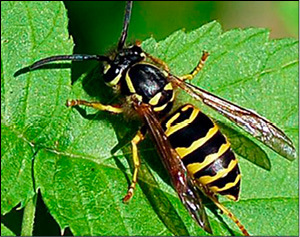 These wasps do not have the “nest guarding” instinct of other wasps and bumble bees. Although cicada killers are not aggressive, females do have stingers and can sting when threatened. This publication is supported in part by the Crop Protection and Pest Management Program [grant No. 2017-70006-27144/accession 1013592] from the U.S. Department of Agriculture’s National Institute of Food and Agriculture. Any opinions, findings, conclusions or recommendations expressed are those of the authors and do not necessarily reflect the view of the USDA.